Explanation: Amazingly detailed, this false-color x-ray image is centered on the galaxy Cygnus A. Recorded by the orbiting Chandra Observatory, Cygnus A is seen here as a spectacular high energy x-ray source. But it is actually more famous at the low energy end of the electromagnetic spectrum as one of the brightest celestial radio sources. 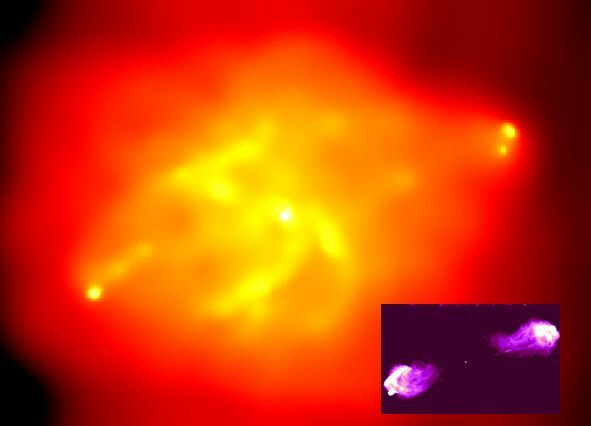 Merely 700 million light-years distant, Cygnus A is the closest powerful radio galaxy and the false-color radio image (inset right) shows remarkable similarity to Chandra's x-ray view. Central in both pictures, the center of Cygnus A shines brightly while emission extends 300,000 light-years to either side along the same axis. 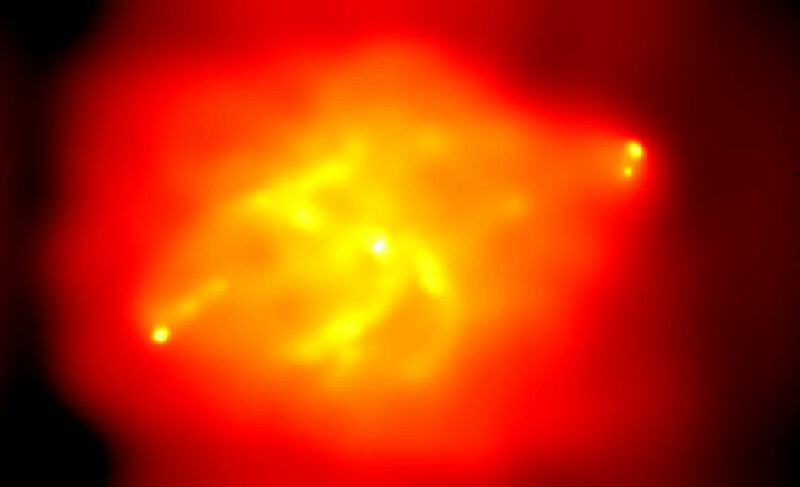 Near light speed jets of atomic particles produced by a massive central black hole are believed to cause the emission. In fact, the x-ray image reveals "hot spots" suggestive of the locations where the particle jets are stopped in surrounding cooler, denser gas. The x-ray image also shows that the jets have cleared out a huge cavity in the surrounding gas. Bright swaths of emission within the cavity likely indicate x-ray hot material ... swirling toward the central black hole.